In stark contrast to his work as Venetian Snares, Winnipeg electronic producer Aaron Funk's collaborative project with Toronto's Joanne Pollock, Poemss, seems to exist in a nocturnal dream state. Gone are the twisted, over-the-top drum breaks, replaced instead with spacious, reverb-heavy percussion hits, deep, underlying bass frequencies, surreal synth sequences and Pollock's wonderfully sombre vocal style. Funk also adds his own distinct baritone vocals to tracks like "Gentle Mirror," turning a simple, stripped-down cut into a captivating duet. While it's apparent that Funk and Pollock are still feeling out the live element of Poemss, their insecurities and apprehensive approach actually work with the material, pushing your attention away from what they're doing on stage and redirecting it to what you're hearing. The one downside to this approach was the long, sometimes dramatic pauses between the tracks. By the time the duo performed a new cut called "Guillotine," their vocal interplay became more natural and mesmerizing at times. 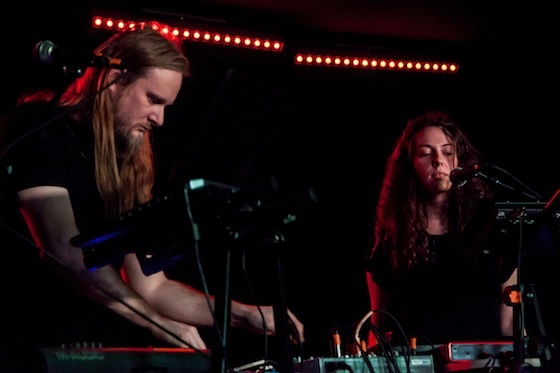 Pollock uses her words and voice like another instrument, giving the songs from the duo's self-titled debut and a number of unreleased tracks they performed more texture and movement. Other new tracks, like "Words in Reverse," "Firework" and "No Memory," kept the same melancholic feel of the evening, pulling the listener deeper into the shadows. As the set progressed, the long, comedown feel of the night was only reinforced by the slow-burning beats that unravelled and bounced off each other. Sedate synth lines drifted across the club like a night fog rolling over the prairies, while the eerie introspection and uneasy rhythms continued to unfold. Poemss may be the most personal work either artist has been involved with yet, but it's still difficult to come away from the night feeling like you know anything more about either of them, and that's not necessarily a bad thing. Digging for meaning and understanding isn't going to have much immediate payoff, but stepping into Poemss' beautiful world, it's easy to forget about everything else.